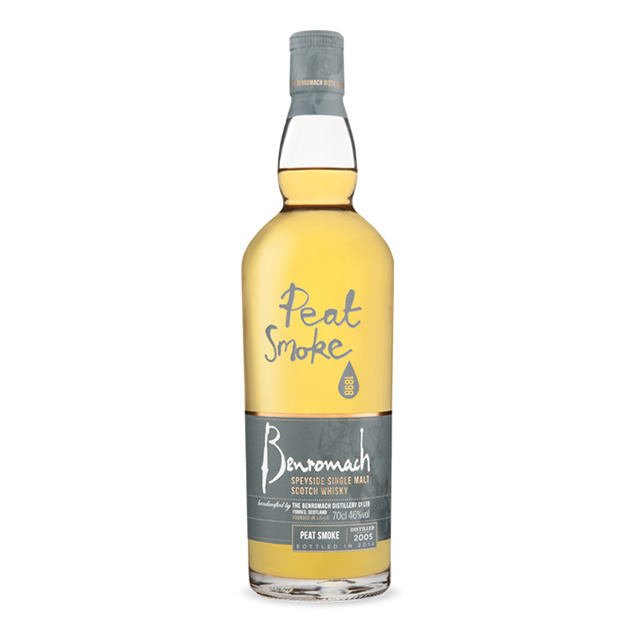 Benromach Peat Smoke	No ratings yet. Pour yourself a dram of this seriously smoky single malt whisky… we only produce very small batches of this unique Benromach Speyside whisky, so you’re one of the few people who are able to enjoy it. The finest Scottish barley is malted with high levels of peat smoke at 67ppm (parts per million: the phenol level, to those in the know). Take in the AROMA WITHOUT WATER… sweet vanilla, honey and cured meat aromas, hints of apricot and lemon combining with a beautiful subtle tobacco note. Dive in and enjoy the TASTE WITHOUT WATER. There’s cracked pepper with sweet strawberry and orange flavours, a delicate hint of aniseed… combined with a lingering edge of bonfire embers. Now enjoy the AROMA WITH WATER… the delicate smokiness complements lemon, honey and vanilla aromaswith sweet hints of apricot and sugared almonds developing on the tongue. Lift it to your lips and savour the TASTE WITH WATER. Slow cooked apple, pear and tangygrapefruit give way to a trace of cocoa powder and an absolutely gorgeous edge of lingering cigars. It’s a wonderfully fruity and smoky single malt whisky. What aromas and tastes do you sense? Tell us what you think.